The fashion gods have really been spoiling me with sartorial choice the past few months - to a point where I don't think I'll be leaving West London at all. 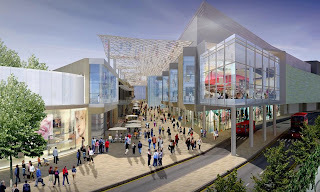 A new shopping centre by the name of Westfield will opening its doors in Shepherd's Bush on 30th October. As well as all your usual high street suspects (All Saints, Bershka, Coast, Dorothy Perkins, French Connection, Jaeger, Kurt Geiger, Mango, Reiss, Topshop and Zara to name but a few) there will also be a 'high end' retail area called "The Village" where shoppers can indulge on designer brands such as Mulberry, Louis Vuitton, Armani and Tommy Hilfiger. 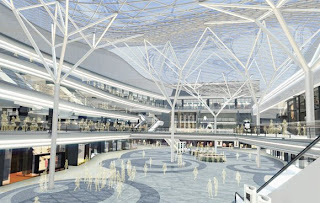 Apparently its going to be the largest shopping centre in London (oo er!) - the interior is looking pretty good! Getting there won't be a problem either, with buses stopping right outside and Shephurd's Bush (Central) and new station Wood Lane (Hammersmith & City) on its western side and Shephurd's Bush railway station on its southern side. Bring it on!